Who knew that crunch was an emotional trigger? Anne Marie Chaker at The Wall Street Journal gave us some new insights how monster consumer brands are amping up texture in products. It seems that preferences for mouth feel can put consumers into one of four categories: chewers; crunchers; smooshers; or suckers. The findings suggest that we reach for snacks that not only match our style but the situation around us. Christine Kalvenes, Frito Lay VP of Innovation, explains in the WSJ online video, that time of day or levels of tension can direct food cravings. Had a long and harried day? Then soothing, creamy foods might smother those stressed-out moments. Likewise, energizing in the morning might call for crisp, citrusy foods. Correlation between mood and food has been an ongoing focus for many in the research community. Concerned psychologists aim to re-direct emotional eating to something more healthy. Depression is not a free ticket to binge eating they might say. Snack companies are of course trying to tap into the emotional state by creating sympathetic foods. This is very much the backstory behind “jacking-up” Doritos for the thrill seeking twenty-somethings. This is part of what firms like The Understanding and Insight Group do when they research human behavior on cravings. Roy H. Williams elegantly described in the Monday Morning Memo, that we have a mood machine already. It’s called the radio. He argues that qualities of music change how we feel. In a similar fashion the written or spoken word through the convention of pitch, key, tempo, rhythm, contour and interval trigger the heart. It’s precisely the science behind poetry. So if emotion is influenced through contour in the ear, might it also be influenced through contour on the palate? What’s fascinating is whether mood influences food choice or whether food choice influences mood. Or both. If we believe the theory that body posture and feelings are co-dependent, then sitting up straight might actually energize the mind. Or that smiling makes you happy, just as much as being happy makes you smile. Let’s be absolutely clear, we mean not to suggest causation; more correlation. We will not fall into the error of Post hoc, ergo propter hoc. Thank you Aaron Sorkin for illustrating this so beautifully in the West Wing. Nor do we want to overlook the powerful brain chemistry at work here. Excitatory neurotransmitters and inhibitory neurotransmitters pull our feelings as the moon does with the tide. The article in How Stuff Works provides an excellent summary of happiness and comfort in food. All things considered, it seems reasonable to elevate our attention to food texture and emotions. This could prove especially handy when planning the next gathering. Might we add excitement through a little crunch? 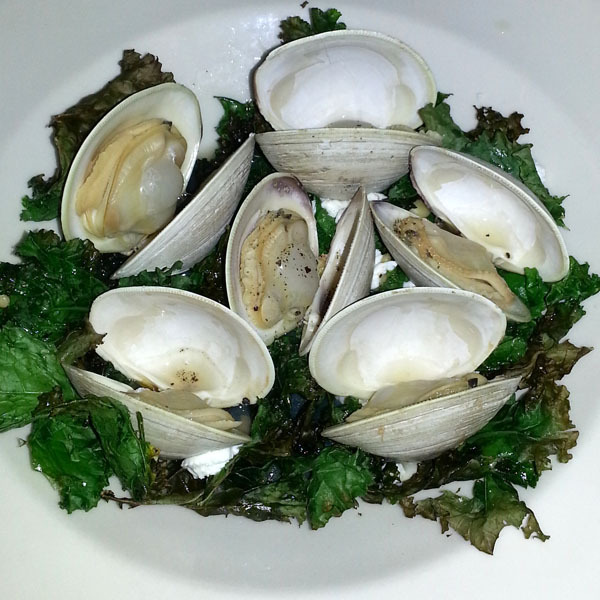 Consider the elegant appetizer of steamed clams on a bed of fried kale pictured above. The contrast of deep umami in the thick chew of the bi-valve is offset by the wispy crunch of the green. The chef was very intentional here. Or consider Tyson Cole, James Beard award-winning chef and owner of Uchiko. Chef Cole tosses crunchy items at us like dodge balls at a middle school competition. 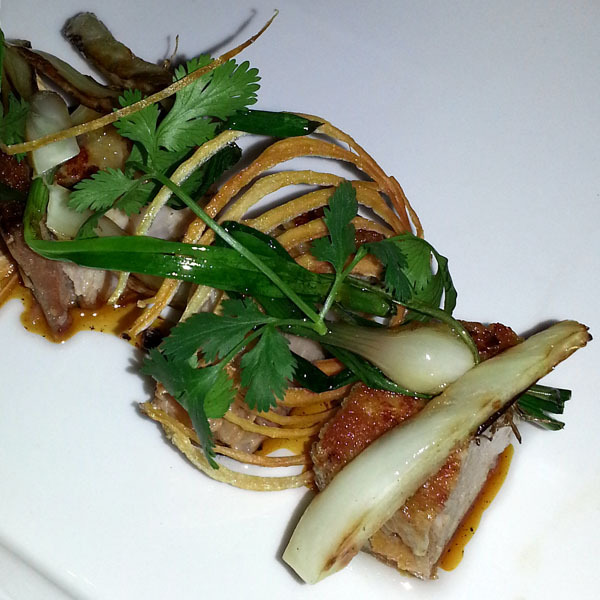 Sultry pork belly pairs with sauteed spring onions accented with a fried slice of fennel bulb. The presentation looks like an aerial view of a sculpture garden. And the texture elicits intrigue as much as the salty smoke of the pork. We could continue with other such examples of texture mapping and feelings but will call it to a close. Rather you are invited to upload your experiences to the comment field. What emotions spiked in the last memorable meal? And how did it roll around the tongue? True insight into what makes me tick.